Perhaps many miles away from yesterday's Bach Masses is the Seattle Phonographers Union and their Building 27 WNP-5 (Prefecture 009). And yet they are both part of a continuum in their own way, from the "staunchly classic" to the frankly experimental. The Seattle Phonographers Union is a group of folks each with a laptop filled with field recordings. They perform in organically ambient enclosures, in this case two man-made buildings. One, Building 27, is a decommissioned aircraft hanger. 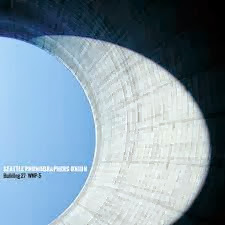 The other, WNP-5, is a partially completed cooling tower for a nuclear power plant. Each has very distinctive, contrasting reverberation characteristics. Each gets its own side on this resonant LP. The field recordings are chosen and EQ'd for playback in these marvelously ambient spaces. It is improvisational in that the players choose spontaneously what they see fit for the performance, in a way similar to Cage's Variations IV where Cage and Tudor chose records in an improvisatory way to excerpt in real time for playback in the performance space. In the Seattle Phonographers case though the ambient environment at hand alters the sounds--be they those of cicadas, a steam hammer, or what have you, so that they are recognizable in various degrees, sometimes virtually impossible to pinpoint as to source with the transformations and combinations. The results are fascinating, more noise that tone but all vaguely or even uneasily "natural" sounding as the sound sculptures evolve. Is this music? Well by now that's readily apparent for those immersed in avant guard doings over the years. Then, is it any good? Yes! As long as you don't try to pin it down as to whether these are a group of budding Bachs or more ingenuous aural engineering compatriots. They are no doubt somewhere in between. No matter how you scratch it (and since this is an LP, you try not to scratch it at all), the album makes for a study in exotic sound mixed in with the very familiar, which might include the footsteps of the audience in the space or birds flying overhead. It fits in nicely with previous Prefecture releases, all of which in one way or another are concerned with "organic ambiance". A blindfold test might well confuse and delight your adventurous friends. Others may not revel in it quite as much. It depends on what you know and how much you want to stretch your ears, I guess. I found it very stimulating.